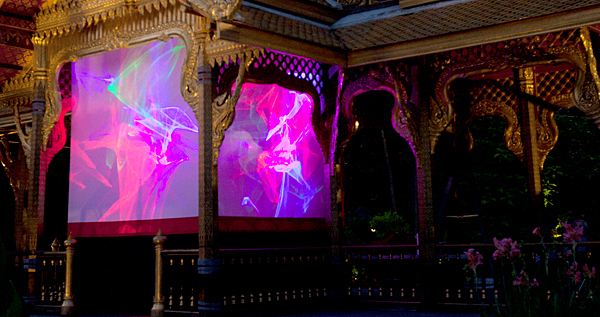 This is a Thai Pavilion with an array of lasers backlighting Thai shadow puppets on rear-projected screens. Nang Talung is the Thai phrase for a shadow puppet show. Usually done with a light bulb behind the puppets; here we use lasers. What are the puppets made of, and where did they come from? The puppets were made in Thailand. They are made from buffalo hide, then painted and have holes punched through them. They depict classical characters from Thai theatrical culture; heroes, princesses, clowns, wizards, and figures from Hinduism. I thought lasers were all beams and points of light. This is a special kind of laser light: lasers are shined through rotating diffractive elements (disks of textured glass), which produce the wispy effect seen here. This is called Lumia. Not the way we do it: the dangerous part is when an unfiltered laser beam hits your eyes. Here there are no focused beams. The lasers emitted by our solid state lasers are not pinpoints; they are spread out. The laser light passes through several rotating disks that diffuse and modulate the energy so they are safe and fill the screens at our short projection distance. Then you view it from the other side of the screen, at which point there is absolutely no danger. How many lasers are involved? There are nine lumia projectors (called “Lumiators”) involved: three on each screen. Each set consists of a red, green, and blue laser. Laser artist Mike Gould, with his crack team of experts in electronics, mechanics, fabrics, and electro-optics. Mike and his team traveled here from the Ann Arbor, Michigan area to present this to you. The process started in December of 2017, when Mike wrote the first proposal. The piece was erected on August 13, 2018, so around 8 months total development time. It took around 10 hours to assemble on site. Where did the hand-waving controls come from? These are based on electronic music circuits developed in 1919 by a Russian Physicist named Lev Termen (in the United States, called Leon Theremin). Today, a Theremin is a musical device played by waving your hands next to antennas to control pitch and volume. Mike wanted to make the piece interactive, so we adapted this circuitry with Arduino-based custom circuit boards to control the brightness and speed of the laser display.